The Russell’s Viper (Dabois russelii) is a venomous snake and a member of the big four snakes in India. 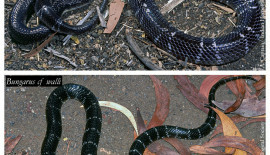 The Russell’s viper is a species responsible for causing the most snakebite incidents and deaths among all venomous snakes. This is on account of many factors such as their wide distribution, generally aggressive demeanour and frequent occurrence in highly populated areas. It’s scales are strongly keeled and has a distinctive bright chain pattern with a large triangular head. The average length of a Russell’s viper is 1 m and 24cm at birth. The Russell’s viper is at home in the open areas, near human habitats where it’s prey (Rodent, Lizards, frogs etc) are found in plenty and in the scrub jungles bordering farm lands. They prefer to be under rock crevices, thick leaves, grass, thorny bushes and cacti. In the oppressive heat they may also be found in termite mounds and rat holes. Though a sluggish snake, when threatened, they are capable of very fast movements in short spurts. They hiss loudly and bite in defence. 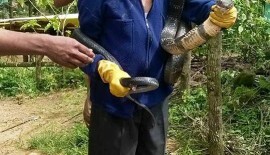 Most victims are plantation workers, estate and farm hands who accidently put their hands or feet in dense bushes or step on the snake in the dark. This snake is viviparous (giving birth to young ones) and produces between 6-63 young ones mainly during the months of May-July. The young are cannibalistic and also eat other snakes, lizards, mice, land crabs, scorpions and other anthropods. Adults depend entirely on rodents and occasionally some birds. Snakes that can be mistaken to the Russell’s viper are the Indian Rock Python (Python molurus) and Common Sand Boa (Eryx conicus). 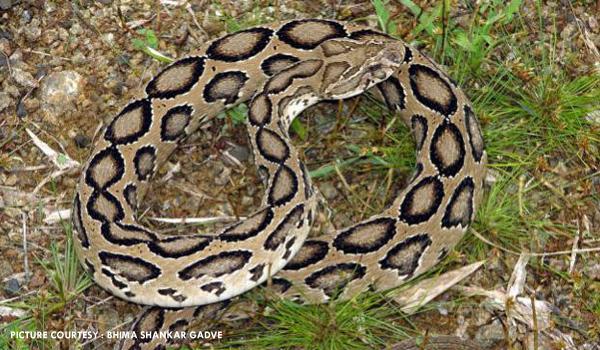 Common local names of the Russell’s viper are : Rough-scaled Boa, Chitti (Hindi), Durkya ghonas (Marathi) and Payyani pampu in Malayalam. Field Guide Book : Snakes of India Romulus Whitaker and Ashok Captain.